The cable length meter Echometer 3000 is a measuring device supporting a quick and simple determination of the length of cables and lines as well as to measure their resistance. The cable length meter Echometer 3000 is applicable in areas of industry, handcrafting, electric utilities or retails for electronic items. Since only one end of the wire needs to be connected to the cable length meter, the device allows measuring wires that are already laid, which leads to a higher time efficiency. The determination of the cable length by means of the cable length meter is performed according to a method called pulse reflection method. Therefore a pulse is sent into a cable, which is sent through the entire cable with a certain speed. As soon as those pulses hit the cable's end, they are reflected back. The period between departure and arrival of the pulse signal is used by the cable length meter to determine the cable's length. If there is a break or short-circuit in the cable, the cable length meter will only show the distance to that break, which helps locating exactly the point, where the damage is. The cable length meter Echometer 3000 features 58 fixed measuring ranges, that are programmed on the most commonly used types of cables and wires. In addition 87 variable measuring ranges allow the user to feed-in information on individual and specific types of cables. The cable length meter is able to detect single- or multiple- lined short-circuits and breakages in process of error localizations. The cable length meter allows, depending on type of cable and wiring, a total length measurement of approx. 2000m. By means of the internal data storage of the cable length meter echometer 300, a maximum of 500 measurements for purposes of inventory e.a. can be performed and recorded. Furthermore the cable length meter is equipped with an RS232 interface to transfer and evaluate the recorded data on a computer. Due to a summating data storage to measure and add information on several cables from the same type you can spare a lot of extra money and time. In addition to a measurement of the length, the cable length meter echometer 3000 also features measuring the resistance of up to 2000 Ohm and an acoustic continuity test. 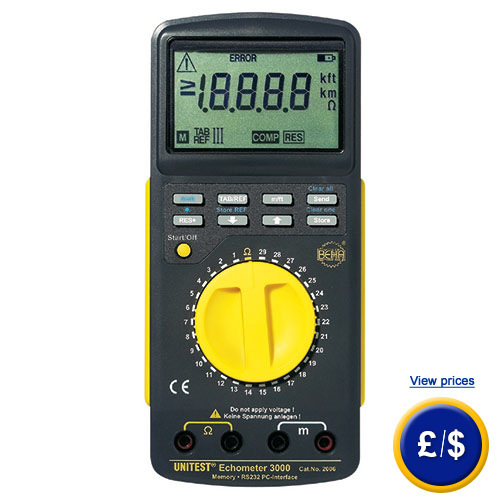 The display with background lights of the cable length meter furthermore allows operating on darker places, e.g. in storages. In case that you should have more questions regarding the cable length meter Echometer 3000, please read the following technical data, use our contact form or call us: UK customers +44(0) 23 809 870 30 / US customers +1-410-387-7703. Our technicians and engineers will gladly advise you regarding the cable length meter or all other products in the field of Control Systems, Laboratory Equipment, Measuring Instruments or Scales and Balances of PCE Instruments Ltd.
Only applicable for wires with at least two conductors applicable!